Three fresh crew members arrived at the International Space Station (ISS) in the new Soyuz MS-01 spacecraft. The trio rendezvoused and docked with the orbiting outpost’s Rassvet module at 12:06 a.m. EDT (04:06 GMT) Saturday, July 9, while flying some 254 miles (409 kilometers) over the South Pacific. A couple of hours later, at 2:26 a.m. EDT (06:26 GMT), the hatches between the two vehicles were opened. 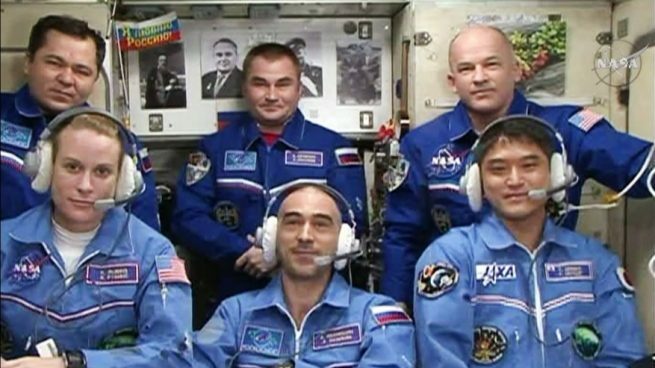 NASA astronaut Kate Rubins and Japanese astronaut Takuya Onishi, both on their first flight into space, as well as Russian cosmonaut Anatoly Ivanishin, on his second mission, floated through the hatch to greet the three members of Expedition 48 already on board. NASA astronaut and station Commander Jeff Williams as well as Russian cosmonauts Oleg Skripochka and Alexey Ovchinin each embraced the incoming three with hugs before all six moved to the Zvezda service module for the traditional post-docking conference with friends and family on the ground. After the conference, the six enjoyed a meal together before the new three were given a safety briefing. The fresh trio then settled into their new living space for their four-month stay aboard the outpost. The arrival of Soyuz MS-01 comes two days after the vehicle launched from Baikonur Cosmodrome in Kazakhstan. This new “Modernized Systems” spacecraft took the longer 34-orbit rendezvous profile, rather than the more recently utilized 4-orbit rendezvous in order to test and verify the new systems installed on the vehicle. Once in orbit, the crew oversaw deployment of the two upgraded solar panels as well as the KURS antenna that would allow for an automatic docking. Among other things throughout the two-day rendezvous, the new Unified Command and Telemetry System was tested. This new system allows the spacecraft to utilize Russia’s Luch data relay satellites—similar to the United States’ Tracking and Data Relay Satellite System—thereby increasing communications with orbiting Soyuz vehicles from short ground station passes on about half of the orbits to about 70 percent of the path around Earth. Over the next number of months, the six crew members will receive multiple resupply ships at the ISS, delivering many tons of food, fuel, supplies, and research. The first, Progress MS-03, will launch on July 17 and dock to the Pirs docking compartment about six hours later. SpaceX’s ninth Commercial Resupply Services mission (CRS-9) will launch the next day, July 18. It will bring with it the first of two International Docking Adapters, IDA-2. IDA-1 was lost during a launch mishap in June 2015. Dragon will arrive at the space station about two days later. Rubins, Ivanishin, and Onishi will remain at the outpost until late October. Williams, Skripochka, and Ovchinin, who have been in space since March 2016, will descend back to Earth in September in their Soyuz TMA-20 spacecraft.